Sip on creamy almond tea with coffee-infused jelly for a refreshing and energizing drink! 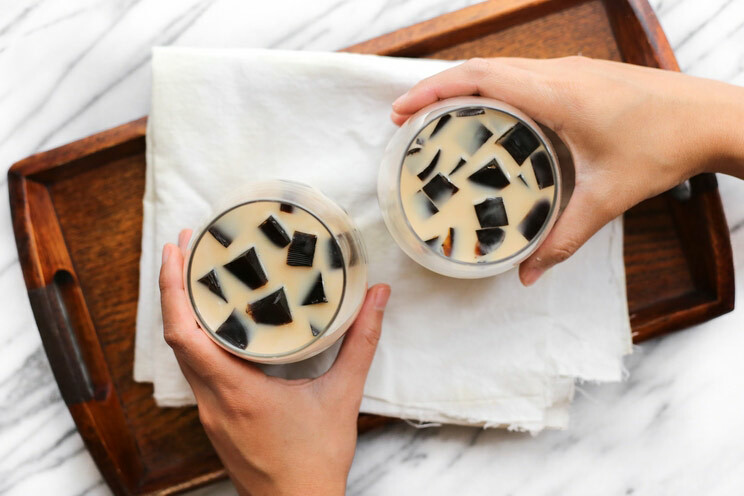 Enjoy chewy jellies made with grass-fed gelatin and brewed coffee for a Paleo-friendly take on a Japanese favorite. Traditional coffee jelly recipes typically contain white sugar. To keep things Paleo, this recipe uses maple syrup as the sweetener and grass-fed gelatin for the texture. Coffee adds a bittersweet edge that offsets the creamy almond milk while black tea adds a light herbal touch. To get started, mix the gelatin powder with cold water. Stir in the brewed coffee with maple syrup and mix until the gelatin dissolves. Tip: You can also use raw honey in place of maple syrup. Pour the mixture into a small baking dish and transfer to the refrigerator. Let it chill for three hours, or until firm. In the meantime, heat up almond milk with water in a large skillet over medium heat. Allow it to simmer for three minutes, without letting it boil. When the milk is hot enough, add the tea bags and steep for 3-4 minutes. Then, remove the bags and stir to combine. Pour the contents into a large pitcher and chill in the fridge for at least one hour. When ready, cut the gelatin into small cubes and divide evenly between two glasses. Fill the glasses with chilled milk-tea and enjoy! Sip on creamy almond tea with coffee-infused jelly for a refreshing and energizing drink. To Make the Coffee Jelly: In a medium bowl, mix the gelatin powder with the cold water. Stir in the brewed coffee with the maple syrup and mix well until the gelatin dissolves. Pour the coffee-gelatin mixture into a small baking dish and transfer to the refrigerator. Allow to chill for three hours, or until solid. To Make the Milk Tea: Combine the almond milk and water together in a large skillet over medium heat. Simmer for three minutes (making sure not to let it boil) and remove from the heat. Add in the tea bags and steep for 3-4 minutes. When ready, remove the tea bags and mix to combine. Transfer to a large pitcher. Set the milk tea in the refrigerator for at least one hour to chill. Once the coffee gelatin is set, cut it into small cubes. Divide the gelatin cubes evenly between two glasses. 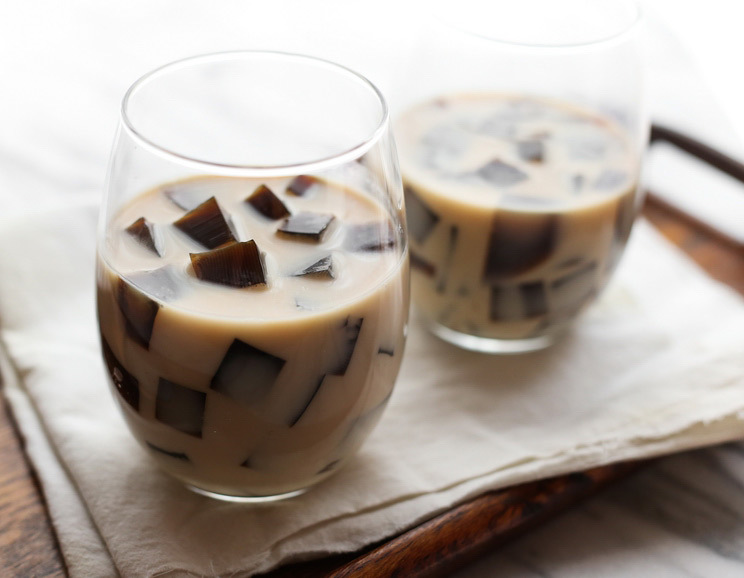 Pour the chilled milk-tea in with the coffee jelly and serve.